Maybe they come with the rain? Last night it rained, and as I did my morning round of “Slug Watching”, I only spotted three slugs and two of their friends, the Snail. Having removed by any means over 275 slugs (not including Snail friends) I was a little surprised to find four very large new slug inhabitants in my front yard. So I think they dropped in with the rain. Logical conclusion? No?? 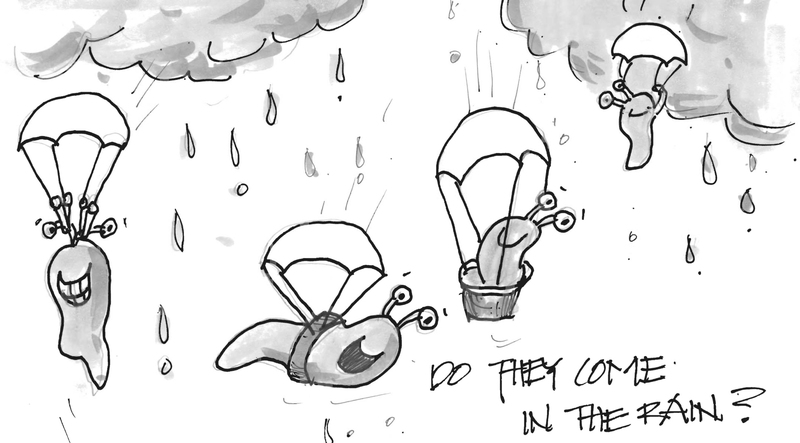 Slug paratroopers are the first wave! The next will come in on amphibious vehicles, just like Ride the Ducks in Seattle. Like the idea. Might be an idea for a new cartoon. Thanks! Assaulting the beach, a la D-Day.